Dried out grass stems defying the winter, which even excelled when the sun was touching the spikes of the ice crystals. 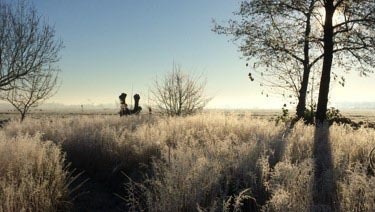 Types like Purple Moor Grass (Molinia) elegantly bending and the 70cm-high flowering spikelets of the Wood Small-reed (Calamagrostis) remaining straight as an arrow in frost and snow, rain and wind. And then now the cut grasses. A whole army of hedgehogs, mopheads, porcupines, hair like punk rockers, tightly arranged side by side, ready to shoot out of the ground. The grasses are slowly coming to life again now and the fields, groups and solitary plants are growing and taking up their modest place within plant combinations. 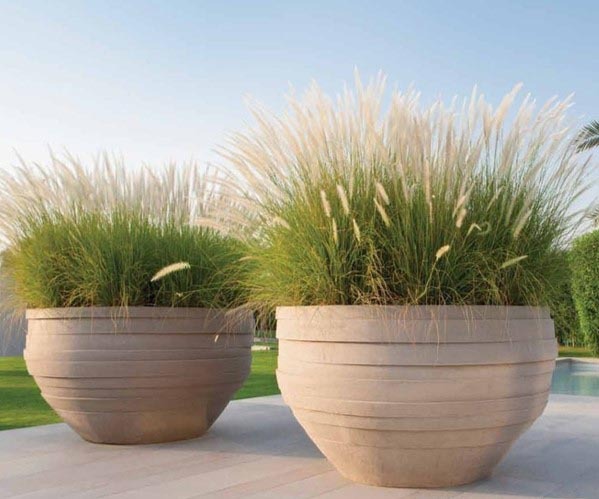 Ornamental grasses do not draw attention to themselves, but provide a stage to the plants, the objects around them or within them. 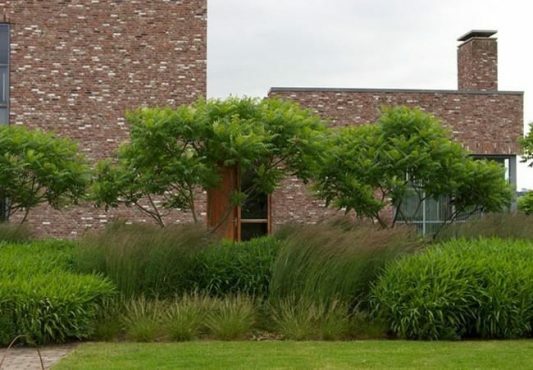 Every green creative likes to work with grasses, as their diversity is so great that a cacophony of plants can achieve a sense of balance by applying them in a scattered way or in groups. The love for grass lies deep within us. Everyone experiences a more intense moment if the light-green expanse of grass is interrupted by the shadow of the forest. Everyone experiences the beauty of the pool on the sheltered side of the dunes bordered with the stiff, hard grass, which lies like a blanket around this water and each of us gains a unique contact with the earth when we walk with our bare feet on the green-haired mat. A true artist who inspires every fellow professional to feast on his know-how and his knowledge about which types to use where and how. 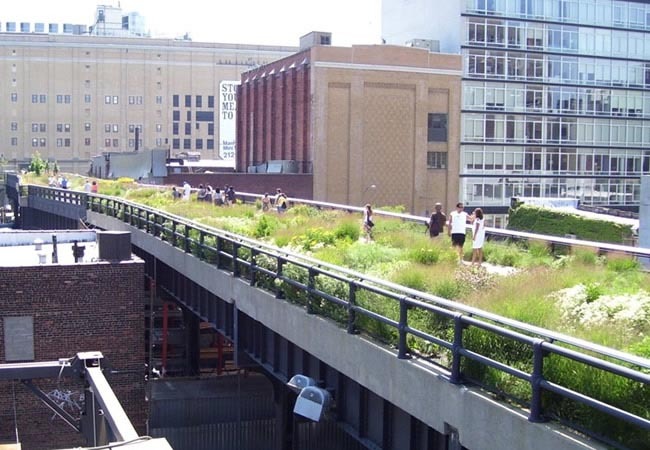 Examples aplenty: in a city like Rotterdam in the public greenery, in a butterfly garden in Utrecht, but also the High Line in New York, etc. Oudolf understands the architecture of the space and the buildings, and creates the connection through the manner of applying his planting, in which grasses play a major role in emulsifying strongly accentuated plant combinations, used like a pinch of salt where the combination of leaves lean too heavily on each other or rather using a field in peace at the right spot where solitary plants like allium, foxglove and coneflower play a modest role. 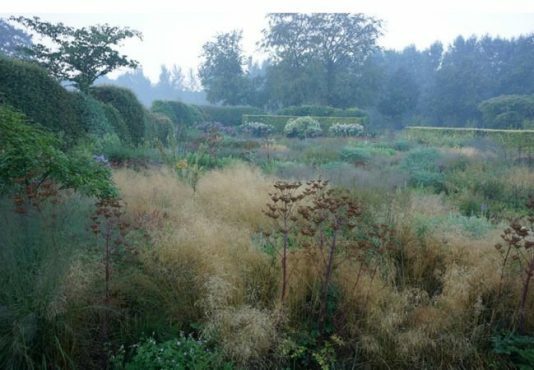 Oudolf understands how to use grasses, but above all he knows the plants with all their characteristics and applies that in such a way that all seasons are visible and the combinations are captivating 12 months long. In the architecture at the start of the previous century, it was Le Corbusier who first devised buildings with free sculptural shapes, a completely new identity, a movement that was imitated an awful lot by peers and still is! 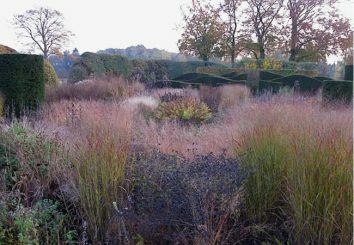 Oudolf was the first person to use plant communities and combinations that are rightly seen as supremely innovative and of great value to the fields of garden and landscape architecture, and architecture, and he is also very often imitated by peers and ‘amateurs’ of some distinction. 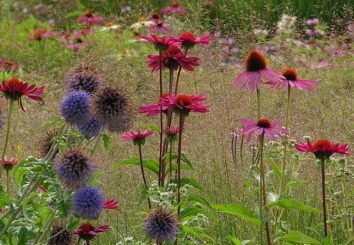 The building blocks of Oudolf are space and buildings, trees and shrubs, perennials and annuals, bulbs and tubers. This composer writes his piece and the players are given plenty of space to demonstrate their beauty, be true to themselves. We meet up a number of times per year. I don’t imitate his art, but I like to share and partly due to the generation gap there is an appropriate element of restraint on my part. I listen to the great master. What makes me happy is that Piet always invites me to the various prize-giving ceremonies, which are original, captivating and inspiring. In November 2014, the presentation of the Prince Bernhard Cultural Fund prize was held in Muziekgebouw aan het IJ in Amsterdam. This was a college for all arts. Every creative unpacked his/her ingredients: rhythms, repetitions, heavy, light, lingering, exuberant, hushed in a unique balance, a balance what was sweet, but also sometimes defiant and brazen. It felt like a warm bath, the translation of Piet’s creations by making the relationships of plants in their combinations visible through music, dance, painting, modelling, sculpting and language. For example, there was the composition Water Music by Handel, while beautiful plan combinations passed by on very large screens. The plant groups transformed into sounds and vice versa. Ballet dancers who emerged with graceful movements from behind billowing sheets, and an angry rap group who performed directly afterwards with their street dance and thus expressed entirely different plant characteristics. The late gifted writer Joost Zwagerman read from the book ‘Dialogue with nature’ by the painter Paul Klee (1879-1940) and compared the emotion and translation of nature by Klee to the method and connections that Oudolf makes. In addition to Oudolf, there were a few greats from the field of garden and landscape architecture: Lancelot (Capability) Brown with his English landscape gardens for aristocratic families, Gaston Lejeune with the English Cottage style and the most famous figure from history was the inventor of the Baroque garden in Versailles for Louis XIV: André le Notre. They devised mega projects and elaborated on building blocks that already existed. 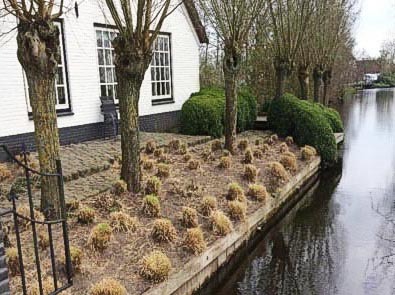 Piet devised a new concept, which even fits in the smallest garden, the versatility of grass.